30 colour photos plus 4pp colour flower guide. It never steered us wrong. Absolutely invaluable for planning my walk and especially for accommodation and transport links. Maintains the hallmarks of these popular Trailblazer LDP guides. 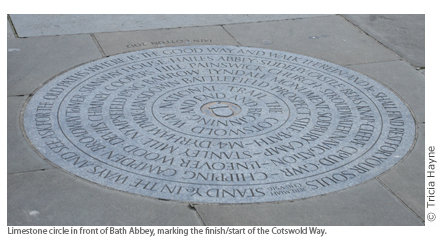 A polished guide to the Cotswold Way National Trail, with detailed maps, GPS waypoints and masses of practical information including a section on 'minimum impact walking'. 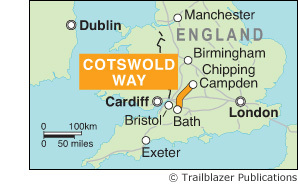 The Cotswold Way is a 102-mile (163km) National Trail that runs from Chipping Campden to Bath, following the beautiful Cotswold escarpment for much of its course. The trail leads through quintessentially English countryside with little villages of honey-coloured stone, from open farmland to the historic city of Bath. Includes accommodation, pubs and restaurants in detailed guides to 48 towns and villages along or near the route. This new 4th edition has been completely rewalked and all the information checked and updated.